Melior Via is just one of the many publishers participating in DriveThruRPG's Christmas in July Sale. It just launched today, and runs for about a week. This year, however, there's one particularly notable change. In addition to marking down ebooks, DriveThruRPG also offered publishers a chance to mark down their print products as well. We've opted into that, and have discounted all of our print products by 15%. 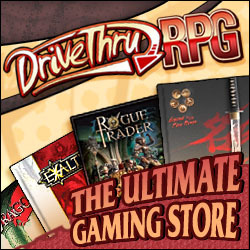 Almost all of these are exclusively available through DriveThruRPG, and we have never had a sale on them before. If you've been considering the Premium Hardcover Color Edition of the Accursed, the Accursed GM Screen, or our Double Deck of Accursed Cards, there has never been a better price. Our Far Away Galaxy Poster Space Battle Map set is also included in the sale. I don't think you'll find another fully illustrated 3 foot x 3 foot battlemap for $5.10. The Thin Blue Line: A Detroit Police Story has been running for about a week now. We've been toying with the 50% funded line for the past couple of days approaching it and even briefly passing it, before a couple of backers had to withdraw. We're grateful for all the support and attention its received to date. We feel like a community is emerging around the project, and that's deeply gratifying.